We're located in the heart of Dallas, Texas! ...so your Dallas area gift can be hand delivered! We also ship nationwide! HOURS OF OPERATION - Monday-Thursday 8:30 a.m.-5 p.m. and Friday 8:30 a.m. - 3 p.m. (CST). Web-based business - there is no retail showroom. Sometimes we can hand deliver on Saturday or you can pick up on Saturday, but the order must be placed by noon Friday (the day before). We do offer scheduled delivery for convention-meeting-conference gifts over the weekend with advance notice. We are closed on Sundays. ORDERS LESS THAN $16.95 - will be shipped. SAME DAY PICK-UP: is available for orders received by 10:00 a.m. CST Monday-Friday. Pick-up between 1 p.m. and 6 p.m. or next day, 8:30 to 6 p.m., at Eagle Postal, 3839 McKinney Ave, Ste 155, Dallas, TX 75204. PRIVACY: We do not share your information with any third party not directly involved in processing, preparing, or shipping your order. SALES TAX: Any item shipped or hand delivered to a Texas address will be charged 8.25% sales tax. SUBSTITUTIONS: We reserve the right to substitute any item of equal or greater value based on availability. 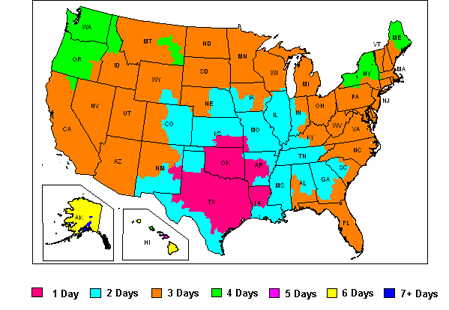 FEDEX MAP BELOW (Estimated Average Shipping Time): Shipments to rural areas may take longer than is indicated on the map. Holiday periods may add an additional day. Expedited shipping is available. Please account for weather conditions as well. Pick up days for shipping is Monday - Friday. Example: A one (1) day transit location shipped on say January 3rd, would arrive on January 4th.